LA police are trying to chase down this Ford Mustang Convertible weaving through a rainy city right this very minute. 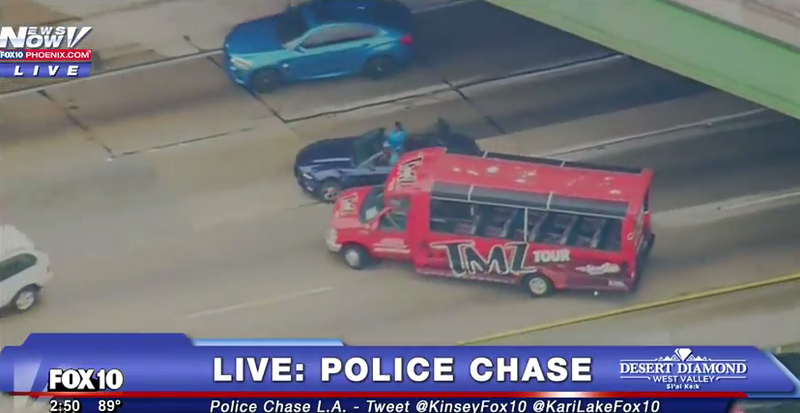 Things are getting wild, as even a TMZ tour bus tried getting in on the action. The bizarre chase has ended. Though the suspected burglars evaded cops in a convertible fifth generation Ford Mustang, they actually drove the car at a snail’s pace for most of the chase. They did rip some donuts on an overpass, though. The chase ended with the suspects pulling up to a house and hugging, shaking hands and snapping selfies with friends. They seemed relaxed as they waited for the police, who arrived about seven minutes later. The suspects then calmly submitted with their hands behind their backs. It was all very weird. As was the commentary. Gizmodo has the pics or it didn’t happen.